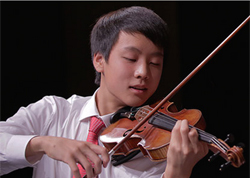 Andrew Lee (violin) won the Prometheus Symphony’s 2016 Young Artists Concerto Competition at age 16 in 2016. He performed Felix Mendelssohn’s Violin Concerto in E minor, Op. 64, with the Orchestra in January 2016. Andrew began studying violin when he was eight with noted violinist Li Lin at the San Francisco Conservatory of Music. Then he was granted a scholarship to study with Zhao Wei, internationally known recording artist, at the Conservatory’s Pre-College Division. No stranger to winning challenging competitions while in high school, Andrew won third prize at the New York International Artists’ Competition, which gave him the opportunity to perform at Weill Recital Hall at Carnegie Hall. Other remarkable accomplishments include grand prize at the Korea Times Youth Music Competition in San Francisco in 2013, first prize at the Pacific Musical Society Competition, the International Music Competition of the Chinese Music Teachers Association of Northern California, and the Young Artist Competition sponsored by the Korean American Music Supporters Association. He has been invited to perform at the prestigious Junior Bach Festival in Berkeley.